NAUMAN, Bruce. Flayed Earth/Flayed Self (Skin/Sink). Los Angeles: Nicholas Wilder Gallery, 1974. 8vo; staple-bound; printed wrappers. Fine. First edition. 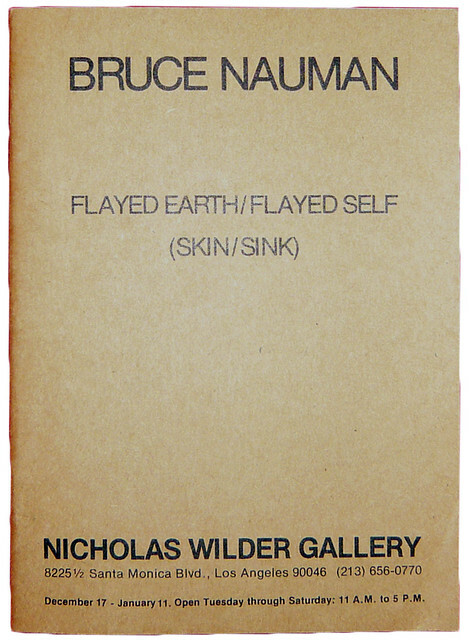 Nauman’s accompaniment to a 1974 exhibition is this small artist’s book consisting entirely of text pieces, including the iconic titular piece. All consist of ambiguous statements, bizarre wordplay and puzzling directives. 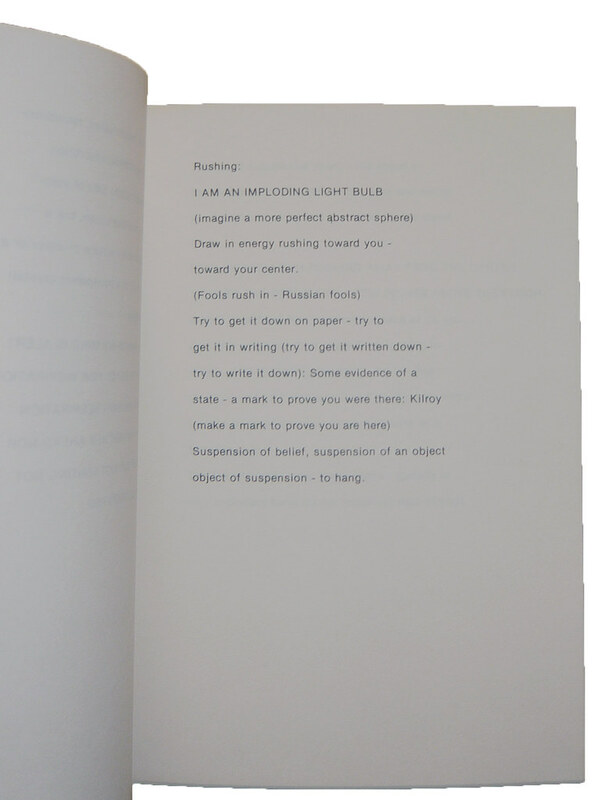 The book came at a moment in Nauman’s career that he has since described as difficult and painful—his 1972 traveling exhibition polarized critics and viewers alike. Though it received some good notices, angry dismissal and excoriation were the more common reactions. Nauman responded by going further with his art and exploring whether it could exist purely as language. His text pieces, unlike Weiner’s, for example, did not aim for concreteness but were intentionally slippery and filled with the possibility of miscommunication. In fact, they were fundamentally about miscommunication. This book is a series of mis-directions, occasions for confusion, and pitfall-riddled thoughts. Nauman’s art is conveyed with only the slightest physical substance. Its design reflects Nauman’s impulse toward the immaterial--it is exceedingly plain, bound in brown paper wrappers and laid out with no visual panache or typographic sensibility--but for all its difficulty, it is one of Nauman’s most rewarding works. BURDEN, Chris. B-Car. Los Angeles: Choke Publications, 1977. Oblong 8vo; illustrated in black and white; illustrated wrappers; staple-bound. Fine. During the two month period between August 24 and October 16, 1975, I conceived, designed, and constructed a small one passenger automobile. My goal was to design a fully operational four-wheel vehicle which would travel 100 miles per hour and achieve 100 miles per gallon. I imagined this vehicle as extremely lightweight, streamlined, and similar in structure to both a bicycle and an airplane. Once the project was conceived, I was compelled to realize it. I set the goal of completing the car for two shows in Europe. I saw building the car as a means toward the end of driving it between galleries in Amsterdam and Paris as a performance. When I arrived in Amsterdam, I knew that the accomplishment of constructing the car had become for me the essential experience. I had already realized the most elaborate fantasy of my life. Driving the car as a performance was not important after the ordeal of bringing it into existence. The car is not completely engineered; most of the parts are hand-made, and many of the decisions in design and construction were based on hunches. As I worked, I kept all the sketches and drawings as a record of the process. Displayed with the car, they became documentation of the construction. The car and drawings represent a vision—my fantasy as an artist of what a car should be. Burden seems to have drawn his inspiration for this little booklet as much from car magazines and auto-dealer advertising pamphlets as from traditional art publications. In this, Burden is squarely within the tradition of California-based conceptualist and minimalist artists-Ruscha, Baldessari, and Robert Irwin, among others, have all discussed the ways in which their aesthetic has been shaped by California’s car culture. Burden’s emphasis on both performance and efficiency now seems particularly prescient. A delightful book, B-Car fascinates in much the same way as any small and well-made technological gadget.